The autumn colors have been extraordinarily vibrant this season here in Connecticut. 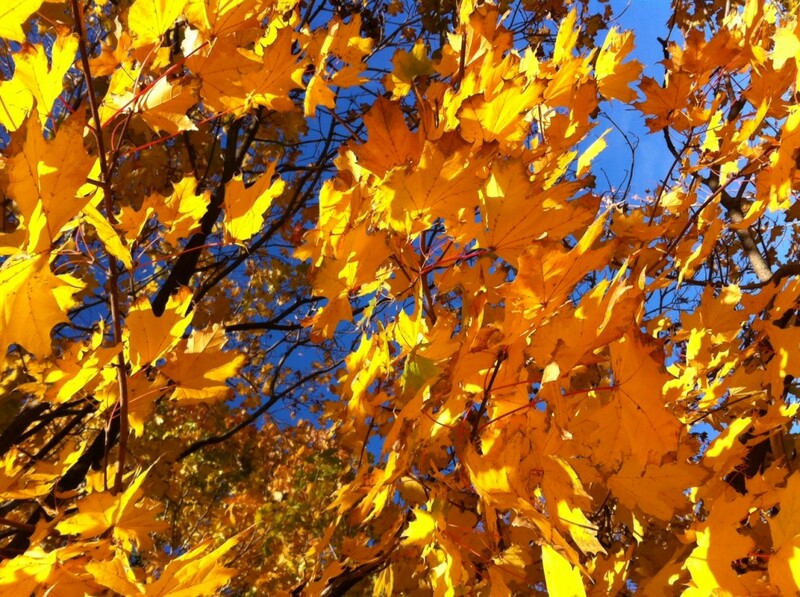 I have been entranced by the beauty and intensity of the azure blue sky and amber color as sunlight filters through the leaves. It just feels good, abundant, grounded and warm. In contrast, fast-forward to the winter months in New England and the environment becomes gray and dull. After awhile, so do our spirits. Part of this is the cold, but mostly it is the absence of color because even the brilliance of white snow lifts our spirits. We can all relate to how color effects our emotions, but did you know that color could assist with healing our bodies as well? Color healing, known as chromotherapy, is not new. It’s been used since ancient times, and there are many ways to practice the art. I recently discovered The Secret Language of Color Cards, by Inna Segal, one of the foremost practitioners of chromotherapy. Inna is a best-selling author and an internationally recognized intuitive healer who cured her own excruciating back pain, after doctors told her nothing could be done, by teaching herself to meditate and asking for divine guidance to help her release the emotional energy blocks that arose in meditation. She realized “such an amazing improvement” that she became dedicated to learning what was behind her power to self-heal. The guidebook also provides a simple visualization exercise for each of the colors. So, for Red — to free yourself from pain — you would imagine a red star at the tip of a red sword of light and then visualize touching the parts of your body that need healing with this sword. The cards help you get familiar with the benefits of colors and how you might use them, but there is not just one single way to use color for healing. Inna shares different ways to use the cards and color in your life, such as considering your wardrobe, especially if you’re the type that sticks to black, navy and grey like I do. Adding color can shift your mood and energy. You might also think about the color in your home and in the food and drinks that you consume. Paying attention to the colors in nature; painting; meditating on a color; or following a guided visualization are all ways to incorporate color healing into your life. 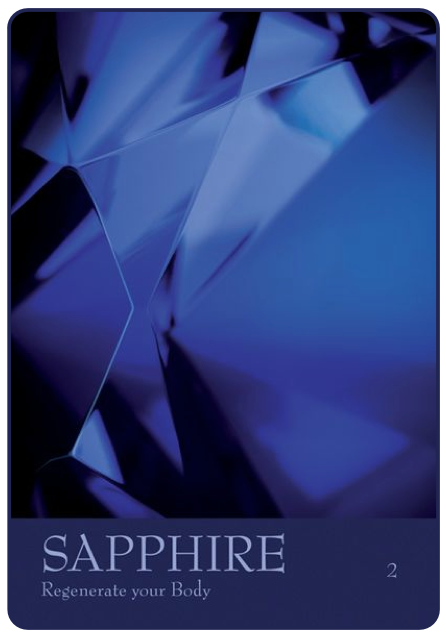 I took the liberty of choosing Sapphire from Inna’s set to share with you. Below is the color card and the description and exercise from the guidebook. I think you will enjoy this color, as it soothes the mind, calms the nerves and releases emotional pain. 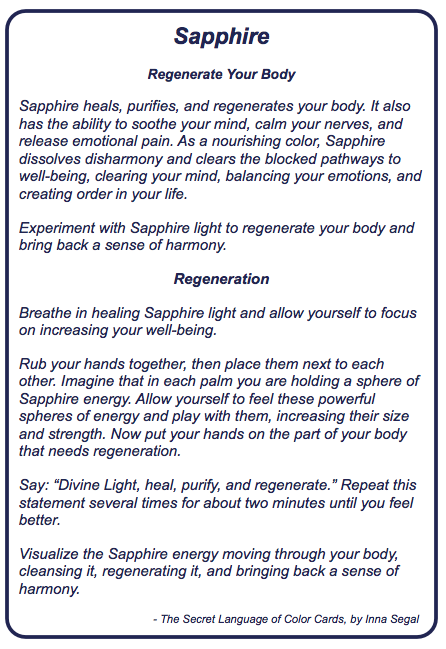 Give it a try — and see if you can feel the regenerative benefits of Sapphire. This entry was posted on Thursday, November 14th, 2013 at 3:35 pm	and is filed under Be Proactive, Book Review, Emotional Support, Stress Reduction, Uncategorized. You can follow any responses to this entry through the RSS 2.0 feed. You can leave a response, or trackback from your own site.